Trusted Platform Module (TPM) was conceived by a computer industry consortium called Trusted Computing Group (TCG), and was standardized by International Organization for Standardization (ISO) and International Electrotechnical Commission (IEC) in 2009 as ISO/IEC 11889. TCG continued to revise the TPM specifications. The last revised edition of TPM Main Specification Version 1.2 was published on March 3, 2011. It consisted of three parts, based on their purpose. For the second major version of TPM, however, TCG released TPM Library Specification 2.0, which builds upon the previously published TPM Main Specification. Its latest edition was released on September 29, 2016, with several errata with the latest one being dated on January 8, 2018. Binding: Encrypts data using the TPM bind key, a unique RSA key descended from a storage key[clarification needed]. Sealing: Similar to binding, but in addition, specifies the TPM state[clarification needed] for the data to be decrypted (unsealed). Computer programs can use a TPM to authenticate hardware devices, since each TPM chip has a unique and secret RSA key burned in as it is produced. Pushing the security down to the hardware level provides more protection than a software-only solution. The United States Department of Defense (DoD) specifies that "new computer assets (e.g., server, desktop, laptop, thin client, tablet, smartphone, personal digital assistant, mobile phone) procured to support DoD will include a TPM version 1.2 or higher where required by DISA STIGs and where such technology is available." DoD anticipates that TPM is to be used for device identification, authentication, encryption, and device integrity verification. The primary scope of TPM is to assure the integrity of a platform. In this context, "integrity" means "behave as intended", and a "platform" is any computer device regardless of its operating system. It is to ensure that the boot process starts from a trusted combination of hardware and software, and continues until the operating system has fully booted and applications are running. An example of TPM use for platform integrity is the Trusted Execution Technology (TXT), which creates a chain of trust. It could remotely attest that a computer is using the specified hardware and software. Full disk encryption utilities, such as dm-crypt and BitLocker, can use this technology to protect the keys used to encrypt the computer's storage devices and provide integrity authentication for a trusted boot pathway that includes firmware and boot sector. Operating systems often require authentication (involving a password or other means) to protect keys, data or systems. If the authentication mechanism is implemented in software only, the access is prone to dictionary attacks. Since TPM is implemented in a dedicated hardware module, a dictionary attack prevention mechanism was built in, which effectively protects against guessing or automated dictionary attacks, while still allowing the user a sufficient and reasonable number of tries. Without this level of protection, only passwords with high complexity would provide sufficient protection. Other uses exist, some of which give rise to privacy concerns. The "physical presence" feature of TPM addresses some of these concerns by requiring BIOS-level confirmation for operations such as activating, deactivating, clearing or changing ownership of TPM by someone who is physically present at the console of the machine. Starting in 2006, many new laptops have been sold with a built-in TPM chip. In the future, this concept could be co-located on an existing motherboard chip in computers, or any other device where the TPM facilities could be employed, such as a cellphone. 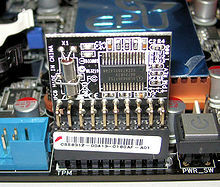 On a PC, either the LPC bus or the SPI bus is used to connect to the TPM chip. TCG has certified TPM chips manufactured by Infineon Technologies, Nuvoton, and STMicroelectronics, having assigned TPM vendor IDs to Advanced Micro Devices, Atmel, Broadcom, IBM, Infineon, Intel, Lenovo, National Semiconductor, Nationz Technologies, Nuvoton, Qualcomm, Rockchip, Standard Microsystems Corporation, STMicroelectronics, Samsung, Sinosun, Texas Instruments, and Winbond. Discrete TPMs are dedicated chips that implement TPM functionality in their own tamper resistant semiconductor package. They are theoretically the most secure type of TPM because the routines implemented in hardware should be more resistant to bugs versus routines implemented in software, and their packages are required to implement some tamper resistance. Integrated TPMs are part of another chip. While they use hardware that resists software bugs, they are not required to implement tamper resistance. Intel has integrated TPMs in some of its chipsets. Firmware TPMs are software-only solutions that run in a CPU's trusted execution environment. Since these TPMs are entirely software solutions that run in trusted execution environments, these TPMs are more likely to be vulnerable to software bugs. AMD, Intel and Qualcomm have implemented firmware TPMs. Software TPMs are software emulators of TPMs that run with no more protection than a regular program gets within an operating system. They depend entirely on the environment that they run in, so they provide no more security than what can be provided by the normal execution environment, and they are vulnerable to their own software bugs and attacks that are penetrating the normal execution environment. They are useful for development purposes. Virtual TPMs are provided by a hypervisor. Therefore, they rely on the hypervisor to provide them with an isolated execution environment that is hidden from the software running inside virtual machines to secure their code from the software in the virtual machines. They can provide a security level comparable to a firmware TPM. While TPM 2.0 addresses many of the same use cases and has similar features, the details are different. TPM 2.0 is not backward compatible to TPM 1.2. Architecture The one-size-fits-all specification consists of three parts. A complete specification consists of a platform-specific specification which references a common four-part TPM 2.0 library. Platform-specific specifications define what parts of the library are mandatory, optional, or banned for that platform; and detail other requirements for that platform. Platform-specific specifications include PC Client, mobile, and Automotive-Thin. Algorithms SHA-1 and RSA are required. AES is optional. Triple DES was once an optional algorithm in earlier versions of TPM 1.2, but has been banned in TPM 1.2 version 94. The MGF1 hash-based mask generation function that is defined in PKCS#1 is required. The PC Client Platform TPM Profile (PTP) Specification requires SHA-1 and SHA-256 for hashes; RSA, ECC using the Barreto-Naehrig 256-bit curve and the NIST P-256 curve for public-key cryptography and asymmetric digital signature generation and verification; HMAC for symmetric digital signature generation and verification; 128-bit AES for symmetric-key algorithm; and the MGF1 hash-based mask generation function that is defined in PKCS#1 are required by the TCG PC Client Platform TPM Profile (PTP) Specification. Many other algorithms are also defined but are optional. Note that Triple DES was readded into TPM 2.0, but with restrictions some values in any 64-bit block..
Crypto Primitives A random number generator, a public-key cryptographic algorithm, a cryptographic hash function, a mask generation function, digital signature generation and verification, and Direct Anonymous Attestation are required. Symmetric-key algorithms and exclusive or are optional. Key generation is also required. A random number generator, public-key cryptographic algorithms, cryptographic hash functions, symmetric-key algorithms, digital signature generation and verification, mask generation functions, exclusive or, and ECC-based Direct Anonymous Attestation using the Barreto-Naehrig 256-bit curve are required by the TCG PC Client Platform TPM Profile (PTP) Specification. The TPM 2.0 common library specification also requires key generation and key derivation functions. Authorization HMAC, PCR, locality, physical presence Password, HMAC, and policy (which covers HMAC, PCR, locality, and physical presence). The TPM 2.0 policy authorization includes the 1.2 HMAC, locality, physical presence, and PCR. It adds authorization based on an asymmetric digital signature, indirection to another authorization secret, counters and time limits, NVRAM values, a particular command or command parameters, and physical presence. It permits the ANDing and ORing of these authorization primitives to construct complex authorization policies. TCG has faced resistance to the deployment of this technology in some areas, where some authors see possible uses not specifically related to Trusted Computing, which may raise privacy concerns. The concerns include the abuse of remote validation of software (where the manufacturer‍—‌and not the user who owns the computer system‍—‌decides what software is allowed to run) and possible ways to follow actions taken by the user being recorded in a database, in a manner that is completely undetectable to the user. The TrueCrypt disk encryption utility, as well as its derivative VeraCrypt, do not support TPM. The original TrueCrypt developers were of the opinion that the exclusive purpose of the TPM is "to protect against attacks that require the attacker to have administrator privileges, or physical access to the computer". The attacker who has physical or administrative access to a computer can circumvent TPM, e.g., by installing a hardware keystroke logger, by resetting TPM, or by capturing memory contents and retrieving TPM-issued keys. As such, the condemning text goes so far as to claim that TPM is entirely redundant. The VeraCrypt publisher has reproduced the original allegation with no changes other than replacing "TrueCrypt" with "VeraCrypt". In 2010, Christopher Tarnovsky presented an attack against TPMs at Black Hat Briefings, where he claimed to be able to extract secrets from a single TPM. He was able to do this after 6 months of work by inserting a probe and spying on an internal bus for the Infineon SLE 66 CL PC. In 2015, as part of the Snowden revelations, it was revealed that in 2010 a US CIA team claimed at an internal conference to have carried out a differential power analysis attack against TPMs that was able to extract secrets. In October 2017, it was reported that a code library developed by Infineon, which had been in widespread use in its TPMs, allowed RSA private keys to be inferred from public keys. As a result, all systems depending upon the privacy of such keys were vulnerable to compromise, such as identity theft or spoofing. Currently TPM is used by nearly all PC and notebook manufacturers, primarily offered on professional product lines. In 2006, with the introduction of first Macintosh models with Intel processors, Apple started to ship Macs with TPM. Apple never provided an official driver, but there was a port under GPL available. Apple has not shipped a computer with TPM since 2006. Atmel manufactures TPM devices that it claims to be compliant to the Trusted Platform Module specification version 1.2 revision 116 and offered with several interfaces (LPC, SPI, and I2C), modes (FIPS 140-2 certified and standard mode), temperature grades (commercial and industrial), and packages (TSSOP and QFN). Atmel's TPMs support PCs and embedded devices. Atmel also provides TPM development kits to support integration of its TPM devices into various embedded designs. Google Compute Engine has support for visualized TPMs (vTPMs) as part of Google Cloud's[disambiguation needed] Shielded VMs product. Infineon provides both TPM chips and TPM software, which is delivered as OEM versions with new computers, as well as separately by Infineon for products with TPM technology which complies to TCG standards. For example, Infineon licensed TPM management software to Broadcom Corp. in 2004. Microsoft operating systems Windows Vista and later use the chip in conjunction with the included disk encryption component named BitLocker. Microsoft had announced that from January 1, 2015 all computers will have to be equipped with a TPM 2.0 module in order to pass Windows 8.1 hardware certification. However, in a December 2014 review of the Windows Certification Program this was instead made an optional requirement. However, TPM 2.0 is required for connected standby systems. Virtual machines running on Hyper-V can have their own virtual TPM module starting with Windows 10 1511 and Windows Server 2016. In 2011, Taiwanese manufacturer MSI launched its Windpad 110W tablet featuring an AMD CPU and Infineon Security Platform TPM, which ships with controlling software version 3.7. The chip is disabled by default but can be enabled with the included, pre-installed software. Nuvoton provides TPM devices implementing Trusted Computing Group (TCG) version 1.2 and 2.0 specifications for PC applications. Nuvoton also provides TPM devices implementing these specifications for embedded systems and IoT (Internet of Things) applications via I2C and SPI host interfaces. Nuvoton's TPM complies with Common Criteria (CC) with assurance level EAL 4 augmented, FIPS 140-2 level 1 and TCG Compliance requirements, all supported within a single device. Oracle ships TPMs in their recent X- and T-Series Systems such as T3 or T4 series of servers. Support is included in Solaris 11. PrivateCore vCage uses TPM chips in conjunction with Intel Trusted Execution Technology (TXT) to validate systems on bootup. In mobile devices security, there are some alternatives to TPM; for example, TrustKernel's T6 secure operating system simulates the functionality of TPM in mobile devices using the ARM TrustZone technology. VMware ESXi hypervisor has supported TPM since 4.x, and from 5.0 it is enabled by default. Xen hypervisor has support of virtualized TPMs. Each guest gets its own unique, emulated, software TPM. KVM, combined with QEMU, has support for virtualized TPMs. As of 2012[update], it supports passing through the physical TPM chip to a single dedicated guest. QEMU 2.11 released on December 2017 also provides emulated TPMs to guests. There are also hybrid types; for example, TPM can be integrated into an Ethernet controller, thus eliminating the need for a separate motherboard component. ^ "ISO/IEC 11889-1:2009 – Information technology – Trusted Platform Module – Part 1: Overview". ISO.org. International Organization for Standardization. May 2009. ^ a b "Trusted Platform Module (TPM) Specifications". Trusted Computing Group. March 1, 2011. ^ a b "TPM Library Specification 2.0". Trusted Computing Group. October 1, 2014. Retrieved April 21, 2018. ^ "Errata for TPM Library Specification 2.0". Trusted Computing Group. June 1, 2015. Retrieved April 21, 2018. ^ Alin Suciu, Tudor Carean (2010). "Benchmarking the True Random Number Generator of TPM Chips". arXiv:1008.2223 [cs.CR]. ^ TPM Main Specification Level 2 (PDF), Part 1 – Design Principles (Version 1.2, Revision 116 ed. ), retrieved September 12, 2017, Our definition of the RNG allows implementation of a Pseudo Random Number Generator (PRNG) algorithm. However, on devices where a hardware source of entropy is available, a PRNG need not be implemented. This specification refers to both RNG and PRNG implementations as the RNG mechanism. There is no need to distinguish between the two at the TCG specification level. ^ "tspi_data_bind(3) – Encrypts data blob" (Posix manual page). Trusted Computing Group. Retrieved October 27, 2009. ^ "TPM – Trusted Platform Module". IBM. Archived from the original on August 3, 2016. ^ Instruction 8500.01 (PDF). US Department of Defense. March 14, 2014. p. 43. ^ "LUKS support for storing keys in TPM NVRAM". github.com. 2013. Retrieved December 19, 2013. ^ Greene, James (2012). "Intel Trusted Execution Technology" (PDF) (white paper). Intel. Retrieved December 18, 2013. ^ Autonomic and Trusted Computing: 4th International Conference (Google Books). ATC. 2007. ISBN 9783540735465. Retrieved May 31, 2014. ^ Pearson, Siani; Balacheff, Boris (2002). Trusted computing platforms: TCPA technology in context. Prentice Hall. ISBN 978-0-13-009220-5. ^ "SetPhysicalPresenceRequest Method of the Win32_Tpm Class". Microsoft. Retrieved June 12, 2009. ^ "TPM Certified Products List". Trusted Computing Group. Retrieved October 1, 2016. ^ "TCG Vendor ID Registry" (PDF). September 23, 2015. Retrieved October 27, 2016. ^ Lich, Brian; Browers, Nick; Hall, Justin; McIlhargey, Bill; Farag, Hany (October 27, 2017). "TPM Recommendations". Microsoft Docs. Microsoft. ^ "Trusted Platform Module 2.0: A Brief Introduction" (PDF). Trusted Computing Group. October 13, 2016. ^ a b Arthur, Will; Challener, David; Goldman, Kenneth (2015). A Practical Guide to TPM 2.0: Using the New Trusted Platform Module in the New Age of Security. New York City: Apress Media, LLC. p. 69. doi:10.1007/978-1-4302-6584-9. ISBN 978-1430265832. ^ "PC Client Protection Profile for TPM 2.0 – Trusted Computing Group". trustedcomputinggroup.org. ^ "TPM 2.0 Mobile Reference Architecture Specification – Trusted Computing Group". trustedcomputinggroup.org. ^ "TCG TPM 2.0 Library Profile for Automotive-Thin". trustedcomputinggroup.org. March 1, 2015. ^ "TrueCrypt User Guide" (PDF). truecrypt.org. TrueCrypt Foundation. February 7, 2012. p. 129 – via grc.com. ^ "FAQ". veracrypt.fr. IDRIX. July 2, 2017. ^ Szczys, Mike (February 9, 2010). "TPM crytography cracked". HACKADAY. Archived from the original on February 12, 2010. ^ Scahill, Jeremy ScahillJosh BegleyJeremy; Begley2015-03-10T07:35:43+00:00, Josh (March 10, 2015). "The CIA Campaign to Steal Apple's Secrets". The Intercept. Retrieved August 10, 2017. ^ "TPM Vulnerabilities to Power Analysis and An Exposed Exploit to Bitlocker – The Intercept". The Intercept. Retrieved August 10, 2017. ^ "Can the NSA Break Microsoft's BitLocker? – Schneier on Security". www.schneier.com. Retrieved August 10, 2017. ^ Singh, Amit, "Trusted Computing for Mac OS X", OS X book . ^ "Your Laptop Data Is Not Safe. So Fix It". PC World. January 20, 2009. ^ a b "Home – Microchip Technology". www.atmel.com. ^ "AN_8965 TPM Part Number Selection Guide – Application Notes – Microchip Technology Inc" (PDF). www.atmel.com. ^ "Home – Microchip Technology". www.atmel.com. ^ "Chromebook security: browsing more securely". Chrome Blog. Retrieved April 7, 2013. ^ "Shielded VMs". Google Cloud. Retrieved April 12, 2019. ^ "Trusted Platform Module (TPM) im LAN-Adapter". Heise Online. Retrieved January 7, 2019. ^ "Windows Hardware Certification Requirements". Microsoft. ^ "Windows Hardware Certification Requirements for Client and Server Systems". Microsoft. ^ "What's new in Hyper-V on Windows Server 2016". Microsoft. ^ "TPM. Complete protection for peace of mind". Winpad 110W. MSI. ^ "Oracle Solaris and Oracle SPARC T4 Servers— Engineered Together for Enterprise Cloud Deployments" (PDF). Oracle. Retrieved October 12, 2012. ^ "tpmadm" (manpage). Oracle. Retrieved October 12, 2012. ^ "T6: TrustZone Based Trusted Kernel". Retrieved January 12, 2015. ^ Security and the Virtualization Layer, VMware . ^ Enabling Intel TXT on Dell PowerEdge Servers with VMware ESXi, Dell . ^ "XEN Virtual Trusted Platform Module (vTPM)". Retrieved September 28, 2015. ^ "QEMU 2.11 Changelog". qemu.org. December 12, 2017. Retrieved February 8, 2018. ^ "Replacing Vulnerable Software with Secure Hardware: The Trusted Platform Module (TPM) and How to Use It in the Enterprise" (PDF). Trusted computing group. 2008. Retrieved June 7, 2014. ^ "NetXtreme Gigabit Ethernet Controller with Integrated TPM1.2 for Desktops". Broadcom. May 6, 2009. Retrieved June 7, 2014. TPM 1.2 Protection Profile (Common Criteria Protection Profile), Trusted Computing Group . PC Client Platform TPM Profile (PTP) Specification (Additional TPM 2.0 specifications as applied to TPMs for PC clients), Trusted Computing Group . PC Client Protection Profile for TPM 2.0 (Common Criteria Protection Profile for TPM 2.0 as applied to PC clients), Trusted Computing Group . Trusted Platform Module (TPM) (Work group web page and list of resources), Trusted Computing Group . "OLS: Linux and trusted computing", LWN . Trusted Platform Module (podcast), GRC, 24:30 . TPM Setup (for Mac OS X), Comet way . "The Security of the Trusted Platform Module (TPM): statement on Princeton Feb 26 paper" (PDF), Bulletin (press release), Trusted Computing Group, February 2008 . "Take Control of TCPA", Linux journal . TPM Reset Attack, Dartmouth . Trusted Platforms (white paper), Intel, IBM Corporation, CiteSeerX 10.1.1.161.7603 . Garrett, Matthew, A short introduction to TPMs, Dream width . Martin, Andrew, Trusted Infrastructure "101" (PDF), PSU . Using the TPM: Machine Authentication and Attestation (PDF), Intro to trusted computing, Open security training . A Root of Trust for Measurement: Mitigating the Lying Endpoint Problem of TNC (PDF), CH: HSR, 2011 .